Purchase our quality PF Series 90 degree elbow today! 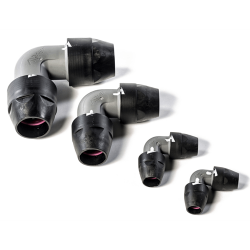 To make sure our pipe elbows fit almost any air line piping, our 90 degree pipe elbow fittings come in multiple standard sizes. The AIRnet 90 degree pipe elbow can also be converted to an NPT connections by adding an Adaptor kit. 4" & 6" - 90-degree elbows require equal unions to make a connection to the pipe. Purchase our 90 degree elbow fittings for your compressed air pipe project today!